I thought I had these posts scheduled to go this week on their own, but turns out I only saved them as draft. *zoinks* It must be my stomach that's addled my brain... I've been a little on the sick side with some stomach issue.. hopefully that goes away soon. Now.. on to the good stuff!! This Clear stamp set comes with a total of 14 stamps! aww sweet bunny and flowers! I had a blast coloring this set. I can imagine all the amazing creations you ODD girl fans will be creating with all the new releases this week!! Check out what the other sensational DT ladies did with this set on the blog. Don't forget there is still time to join in on the March Sketch Challenge anddd you can share your creations on the Some Odd Girl Facebook page too... you could totally be spotlighted on Friday on the blog!! Hope you have a fabulous Wednesday. 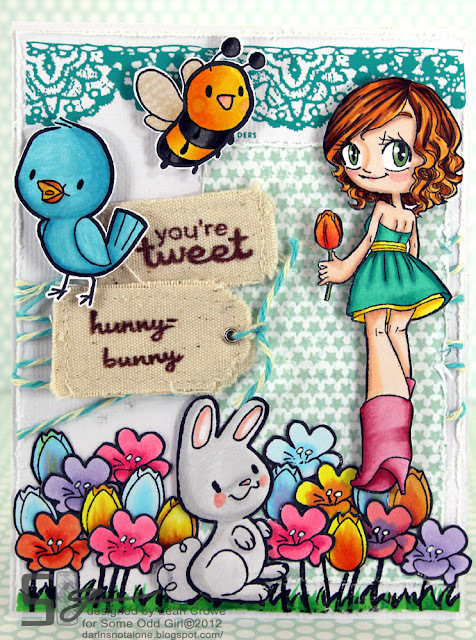 Oh my goodness...you are rocking the stamping and cards! Is that using the Copic markers? I have never tried them, but always admire those that use them...the colors are amazing! Sooooooooo cute cute cute! I loveeeeeeeeeee the colors and loving the tags!!!! wow leah your colouring is amazing i just loev your card, you are so talented.